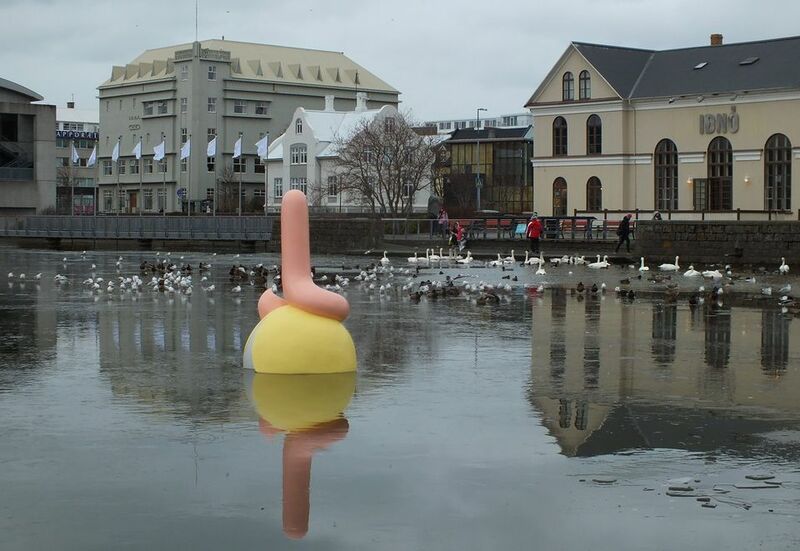 A phallic “little mer-sausage” has been installed in the centre of Reykjavik, Iceland. Litla Hafpulsan (2018), a large pink sculpture resembling a hot dog sausage with an elegant fish’s tail, was erected as part of the city’s Cycle festival of music and art. Situated on Lake Tjörnin in the centre of the Icelandic capital, the work was created by the Icelandic artist Steinunn Gunnlaugsdóttir as a response to the centenary of the country’s independence from Denmark. Litla Hafpulsan is placed in dialogue with a version of The Little Mermaid by Nína Sæmundsson, a replica of a statue given to the city by the former colonial ruler in the 1940s. The original was blown up in an unsolved act of vandalism on 1 January 1960. While the work was revealed to cheers and giggles from art lovers present on the evening of 26 October, it has also attracted some criticism; the hotdog bears an undeniable resemblance to male anatomy and has drawn some negative reactions from locals who took to social media. On the city’s Facebook page Jennifer Ása wrote “Come on, seriously? Please tell me that this isn’t a permanent installation. That’s sacred space where it is currently located and should be treated as such.” Friðjón Valtýr suggested that the work “looks like a more giant worm on top of an egg than art”. Meanwhile, the photographer Eva Björk took to Twitter to compare the work to Patrick from the popular cartoon SpongeBob SquarePants. “People either want it to be removed immediately, or they want it to stay there forever,” Gunnlaugsdóttir says.